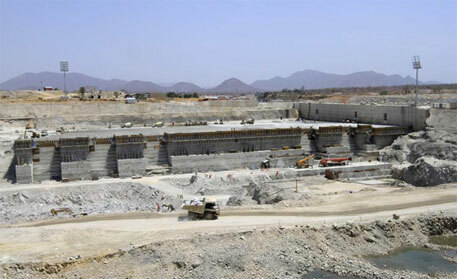 Renaissance dam, the $4 billion Ethiopian dam which is slated to be the largest on the continent, has become a cause for concern for Egypt, Sudan and other countries. They are worried that the project, whose reservoir will hold 74 billion cubic metres of Nile water, will disrupt flows to downstream countries. Egypt and Sudan, along with Ethiopia, announced last week that they have moved towards an agreement to study the impact of the dam. "The committee agreed to short-list seven consultancy firms to undertake the hydrological and socio-environmental studies," the water ministers said in a statement, according to a Reuters report. The statement confirmed that British construction law firm Corbett has been chosen to oversee the administrative aspects of the studies. Once ready, the Renaissance dam will aim to generate 6,000 megawatts of electricity and supply it to countries as far as South Africa and Morocco. Egypt is concerned that years of filling the reservoir will temporarily cut the flow of the Nile, according to the Reuters report. The country depends heavily on the water of the Nile for agriculture, industry and drinking water. It also fears that surface water evaporation over the new lake will reduce it permanently. The concern in Egypt is so serious that it cost President Mohamed Morsi his job in July last year. Military general Abdel Fatah al-Sisi deposed Morsi to become the de facto ruler after the sitting president’s apparent inaction over the “existential threat” the project posed to Egypt’s “national strategic interest”. Construction, however, continues and the Ethiopian government has refused to guarantee that the dam would not affect Egypt. "Ethiopia designs all the dams in the country in a way that does not harm significantly the downstream countries," Ethiopia Water Minister Alemayehu Tegenu said. "This is a principle. This principle by itself is very important. There is no need to give a guarantee." The next round of talks will take place in November during which, countries are expected to choose a firm to conduct the socio-environmental study. Four years ago a team of nine countries including Ethiopia visited Cauvery delta and held discussions with farmers of Tamil Nadu & Karnataka and also Madras Institute of Development studies which had eight years ago started a dialogue process between the riparian states of Karnataka, Tamil Nadu & Pondicherry on the Cauvery issue hanging on fire for several decades. The article of the Ethiopian dam reminds the urgent need to resume the dialog between the two states since at the moment it is in cold storage for almost two years.